If you're visiting San Diego for the first time, you may be overwhelmed by all the options of things to do. From the world-famous zoo to the gorgeous beaches, ultra-trendy nightclubs to the grand historic districts, there is something for everyone when visiting this Southern California city and most of these can be done even if you only have one day in town. No matter what time of year you visit, you need to make your way to the beach; it's what personifies the San Diego lifestyle. Watch the waves roll in from a bluff or on the sand. Soak in the beach life all along the coast and then watch the sunset. Best bet: Make your way to Mission Beach and the Belmont Park rollercoaster for some exhilarating fun by the waves. It's San Diego's unofficial delicacy: deep-fried, battered fish wrapped in a corn tortilla with cabbage and sauce. If you've never had one, it sounds weird. If you try one, you'll crave it every time you visit San Diego. Best bet: Hit one of the many Rubio's restaurants, the originator of the San Diego fish taco or check out one of the favorite San Diego fish taco options, like Brigantine or South Beach Bar and Grille. Best bet: Buy an all-day pass and just ride; you'll get a good idea of what San Diego is all about. Sure, you can go to Sea World or Legoland, but you'll regret missing the lovable giant pandas at the world-famous San Diego Zoo. The city's venerable tourist attraction is home to numerous giant pandas, which you can also watch on the Panda Cam on the Zoo's website. Best bet: Visit the Zoo early in the morning; that's when you're most likely to see the pandas active and not sleeping. After you visit the pandas at the zoo, head over to nearby Balboa Park, which is San Diego's public playground and cultural center. Enjoy the lovely green space and visit one of the many wonderful museums as well as the famous Old Globe Theatre. Best bet: Visit the park on Tuesdays, when many museums have free admission. Dine at the Prado Restaurant for great food in a fantastic setting, or just bring a picnic lunch and enjoy the scenery. 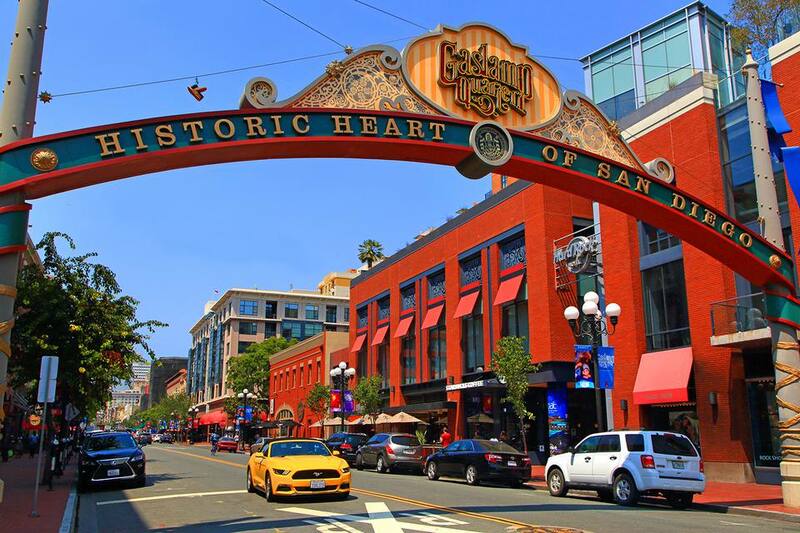 It's San Diego's center of nightlife, and the Gaslamp Quarter in downtown is where you'll want to be if you're looking for restaurants, dancing, or just people watching. You'll find eating establishments to suit every taste, all within walking distance of one another, plus a variety of bars and dance clubs. Best bet: Stroll along Fifth Avenue to take in the vibe of the Gaslamp Quarter and then enjoy a meal sitting at a sidewalk table as the world walks by. Cap off the night with a show at the nearby House of Blues. Ritzy La Jolla is the seaside enclave that practically every visitor to San Diego has heard about, and it is deserving of its reputation. A beautiful village around a picturesque cove, La Jolla is where the rich and beautiful people live and hang out, but is unpretentious and fun for the non-rich and famous, too. Eating at the gourmet restaurants, visiting the stylish boutiques, and watching the surf and seals by the La Jolla Cove makes for an enjoyable full day outing. Best bet: Head down to the La Jolla Cove and look for sea creatures trapped in the tide pools within the rocky terrain when the tide is out. The only way for you to get an idea of how important the waterfront is to San Diego is to sail on San Diego Bay. The Harbor Cruise gives you the best vantage to do this, where you'll cruise by the huge Navy ships, sportfishing and pleasure craft, waterfront hotels, the downtown skyline, and under the sweeping San Diego Bay Bridge. Sure it's touristy, but it's also marvelously memorable. Best bet: Don't miss spotting the Star of India tall ship and maybe even an aircraft carrier docked on North Island. Historical San Diego isn't always evident, but a sure bet to take in the city's past is to visit Old Town State Historic Park. It can be overly touristy and contrived, but if you look hard enough, you can find authentic snippets of San Diego's past. Best bet: There are many fine restaurants in Old Town, but the Old Town Mexican Cafe with its homemade tortillas is among the most popular choices.